The add-in Lights-Out has been updated. Fix #227932 Wake domain is not saved on client side. Fix #625005 Backup wake task is not working for setting “Always on during configured backup time”. Fix #997366 Disabled time span does not count down in console. Fix #498650 Detection of server 2016 evaluation improved. Fix #104472 Shutdown fails on WHS 2011 if forced. Fix #415692 Deadlock in Dashboard. Fix #746979 Console does not store individual mac addresses for each server in MRU list. Fix #512539 Devices are not sorted by name in uptime chart. Fix #512539 Calendar entry changes the end date if end is on next day. Fixed disabling monitors (ShadowCopies, TaskScheduler). Fixed shutdown blocker in Client Software if a backup is running. 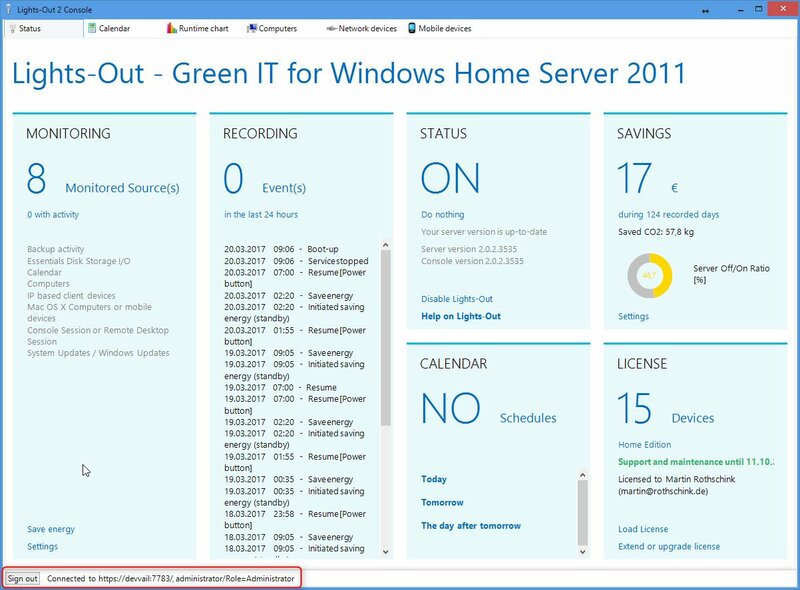 Fixed detection of storage server and server 2012 with essentials role. Fixed action after backup in calendar if not forced. Added a status panel in console to allow sign off to connect to another server without leaving console. Added support for TLS 1.1 and 1.2. Added Windows Update monitoring (experimental). Added sorting of next calendar events in status tab. Added HD/SSD detection to installer. If a HD is detected, service start type is set to “automatic (delayed)”. Replaced wake tasks with waiteable timer. Improved time to wake server after client resume/reboot.